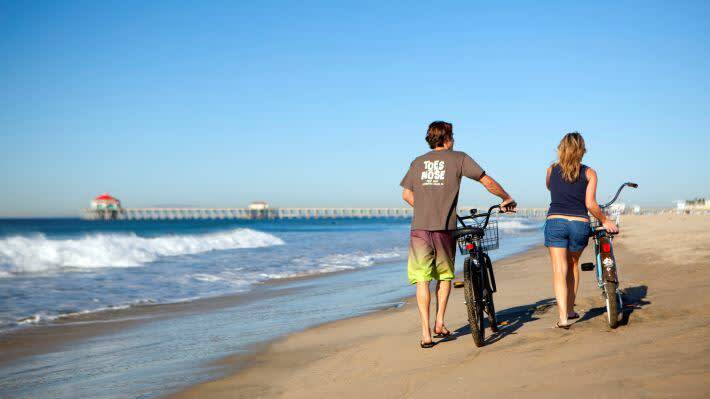 The 10 mile long Ocean Strand is a paved path that runs along the Huntington Beach coastline. 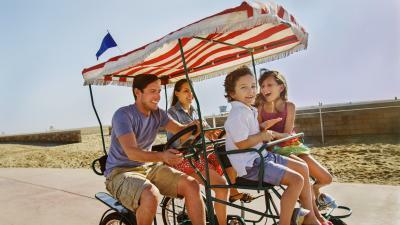 Voted one of the top 10 coastal trails in the United States by Coastal Living Magazine, the Ocean Strand allows bikers, joggers, walkers and skaters to enjoy the ocean breeze and panoramic ocean views. Beach concessions along the path rent bicycles by the hour or day. Pedego in downtown Huntington Beach even rents electric bikes for those who want a little assistance. The Ocean Strand also connects to the Santa Ana River Trail for an additional 110 miles of recreation, ending in Big Bear Lake high in the San Bernardino Mountains. The third annual OCTA Bike Festival returns to Huntington Beach Pier Plaza on April 27 from 9am to 1pm. This popular event kicks-off Bike Month and promotes biking to work, for recreation, and to run errands. Learn about equipment, bike safety and basic maintenance skills. Vendors will be on hand for all types of cyclists from the casual user to the commuter to the weekend warrior. Looking for a secure spot to leave your bicycle while exploring downtown on weekends and Tuesday evenings? Take advantage of the free bike valet at Pedego in downtown Huntington Beach.